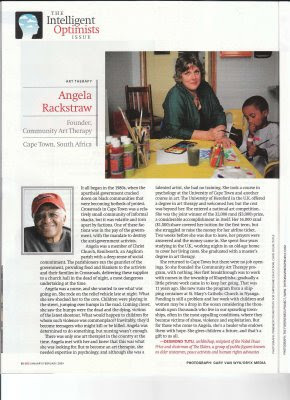 ANGELA RACKSTRAW of the COMMUNITY ARTS THERAPY Programme, Cape Town, S. Africa is featured in the January 2009 issue of ODE MAGAZINE as one of the World's "Intelligent Optimists." as selected by the Most Reverend Archbishop Desmond Tutu. ODE MAGAZINE for recognizing her efforts. FOR THOSE YOU LOVE; AND FOR THE WORLD. YOU CARRY WITH YOU THE SPIRIT OF PEACE. KEEP GIVING IT A CHANCE IN 2009! California. A packed driveway in Knoxville, Tennessee. 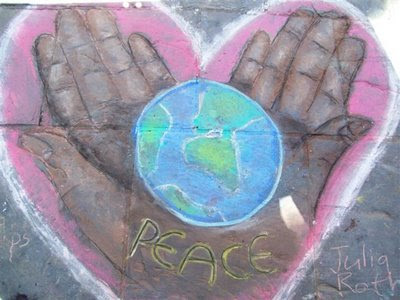 for world peace every September. to show the world that we are giving peace its chance. realistic chance of achieving our 2009 goal. 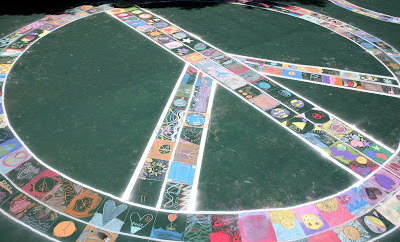 Title Post or by mailing a check made out to CHALK4PEACE, Inc.
We do not ask much; but we do ask that you participate. of the law. 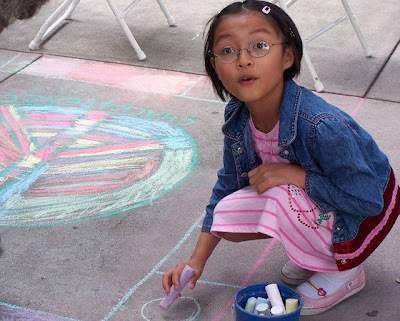 Be a CHALKSTAR! 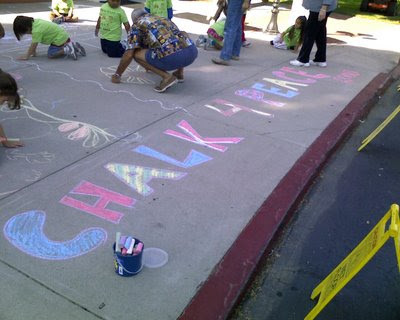 Support CHALK4PEACE! MADE AN AWESOME VIDEO ABOUT THEIR EVENT! Click on the Title Post to see it on YouTube! 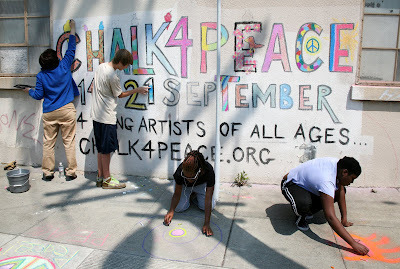 heard if they were able to participate again in CHALK4PEACE. WE CERTAINLY HOPE SO! 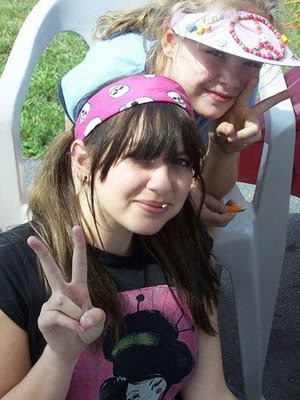 This photo is from 2007. 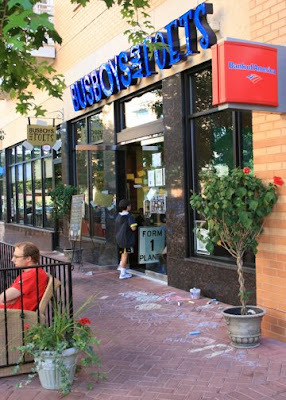 EVENT AT THE BOULDER PUBLIC LIBRARY SEPT. 14. NICE WORK BOULDER! OUR THANKS TO DONNA, CAROL AND CREW...! Photo courtesy of the Newlin Family. 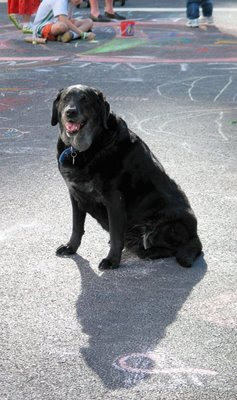 CHAPIN TRAUGOTT, Upstate New York CHALKSTAR. 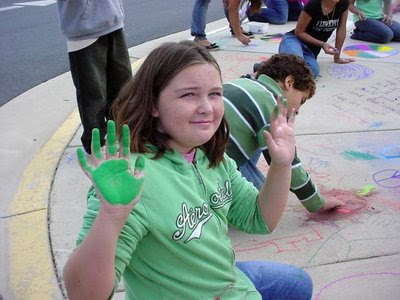 she organized for the second year running. AND VICE PRESIDENT ELECT BIDEN. TODAY IS YOUR TIME TO SHINE! FRIENDLY HALLOWEEN SAFETY REMINDER FROM CHALK4PEACE! 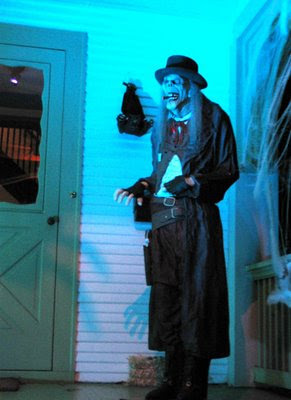 DON'T LET HIM IN!!!! HE'S A LOBBYIST! MAY THE KID IN YOU FOLLOW THE SPIRIT THIS EVE! HAPPY HALLOWEEN FROM ALL OF US AT CHALK4PEACE! 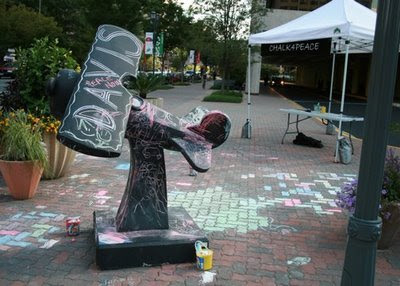 CHALK4PEACE TOOK FLIGHT IN VIRGINIA! 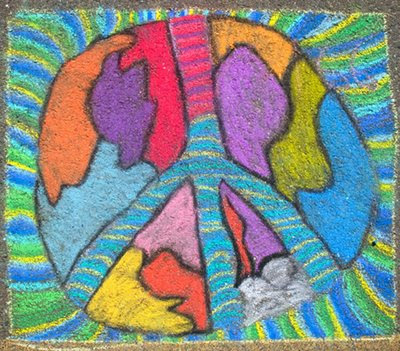 CHALK4PEACE surrounding Rob Mandle's "Chalk It Up"
and passersby left their marks from September 18-25. YOU REPAINTED THE PLANET THE COLORS OF PEACE! CLICK ON THE TITLE OF THIS POST TO SEE THE PHOTOS! Contact: Kim Belchamber, President, P.A.I.N.T.S. Over 400 artists drew at this amazing extravaganza! 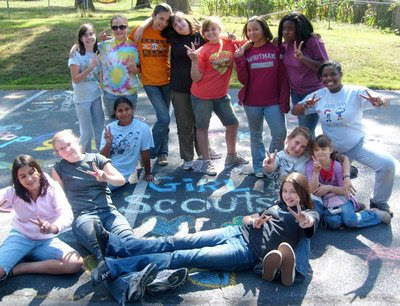 "Fill in the Peace Sign"
9:30-12pm: chalkin' up the sidewalks with peace!! Peace Maypole and Lots of Music! MOCHA, Oakland, CA 1-4 pm. 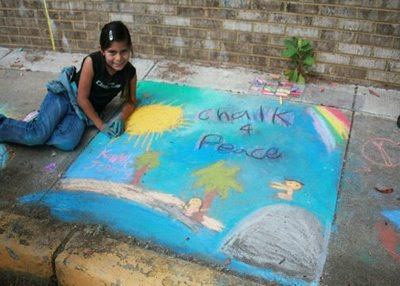 Chalk It Up To Peace! 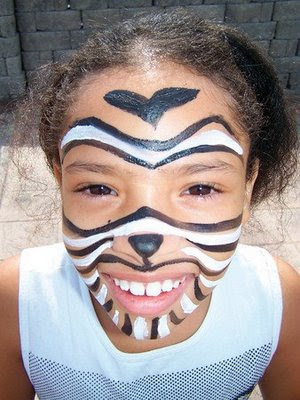 Spirit of the Day...Art, Fun & Play!! IT JUST KEEPS GROWING THANKS TO YOU! 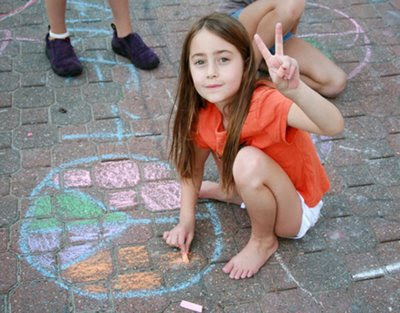 CHALK4PEACE IS EXCITED TO SEE YOUR PHOTOS! 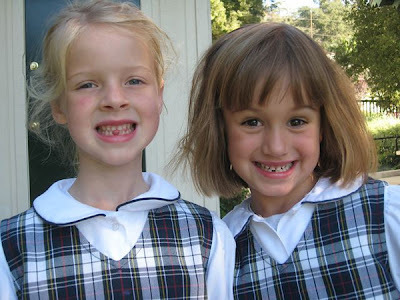 Cathedral Sunday School and home schoolers. 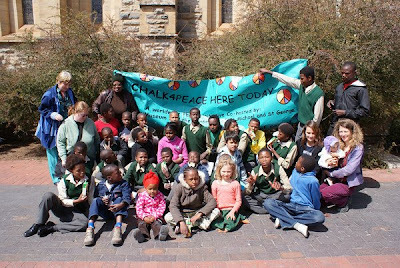 published an article about Grahamtown's CHALK4PEACE event. 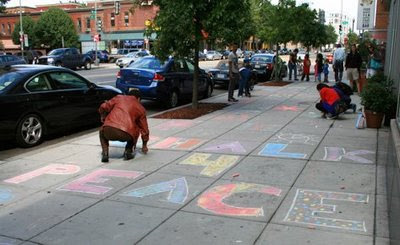 THEIR DRIVEWAY INTO A CHALK4PEACE GLOBAL DESTINATION! 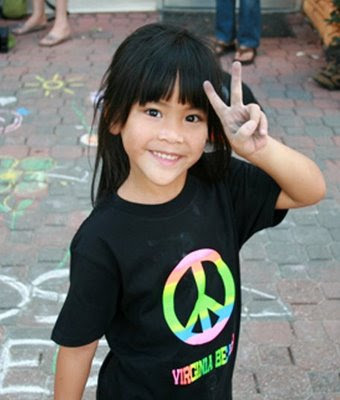 A Belated Happy Birthday to John and Sean Lennon from EVERYONE who did CHALK4PEACE...! 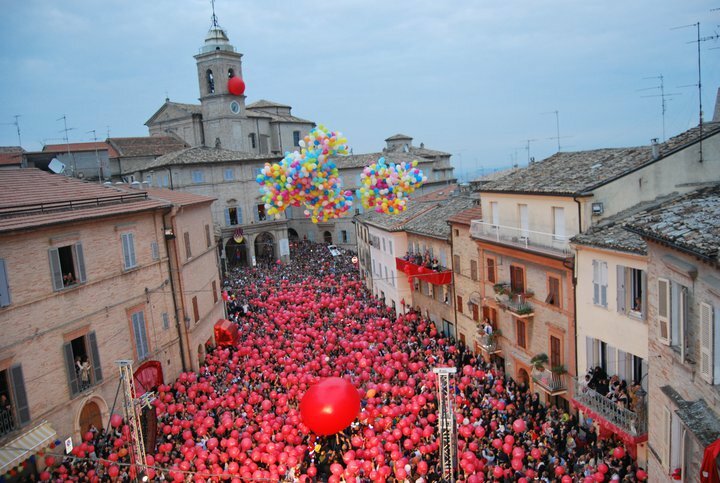 TOGETHER 4 PEACE IN MORE THAN 150 LOCATIONS WORLDWIDE! MORE THAN 100,000 FOLKS JOINED US AS A RESULT OF YOUR EFFORTS! YOU ARE AWESOME! AS IN GRAND CANYON AWESOME! WE ARE BLESSED TO KNOW YOU! THANK YOU! LET'S DO IT AGAIN NEXT YEAR! PHOTOS FROM AROUND THE WORLD! 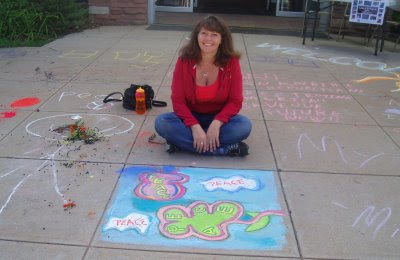 CLICK ON THE TITLE OF THIS POST TO SEE PHOTO ESSAYS FROM MORE THAN 20 CHALK4PEACE 2008 LOCATIONS! 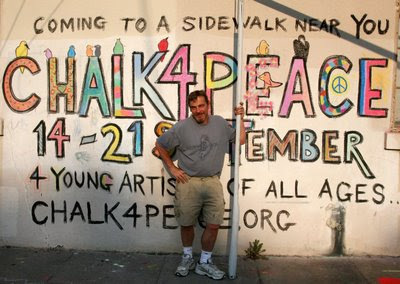 YOUR RESPONSE TO CHALK4PEACE IS OVERWHELMING! OVER 2,000 PHOTOS HAVE COME IN! WE KNOW THERE'S MORE! 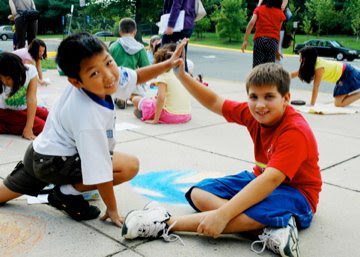 5% of dinner revenue is donated to CHALK4PEACE, Inc.
"BECAUSE OF YOU, WE CAN..."
Eighteen Fairfax County Public School SACC Programs Join CHALK4PEACE! please click on Today's Post Title above. WHAT A AMAZING EVENT! WHAT AMAZING RESPONSE! are many more of YOU! NORTHERN VIRGINIA RAISES SOME DUST! 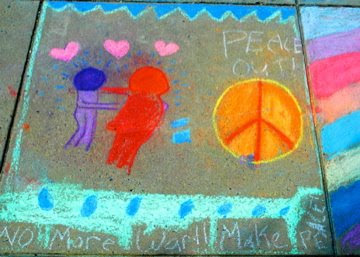 CHALK4PEACE PHOTOS ARE POURING IN! COMING SOON!!! 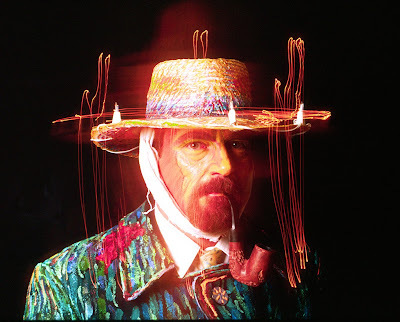 Online galleries for the world to see! 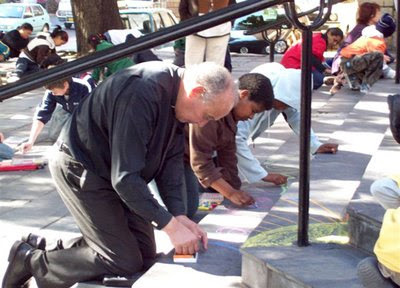 joining CHALK4PEACE for the second year. idea that peace is always deserviung of its chance. A link to their gallery will be posted soon. THE WORLD'S GETTING DOWN AND DUSTY! WE ARE COLLECTIVELY CREATING A DIALOG ABOUT PEACE. lens with which we see Peace. both coasts in the US attending as many events as time allows. 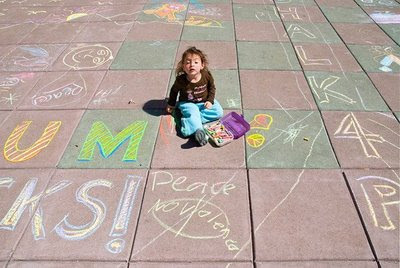 is daunting as CHALK4PEACE grows larger by the day! Since YOU are rising to the challenge, WE are too! There are, literally, thousands of people to thank. YOUR DONATION HELPS US STEER IT! 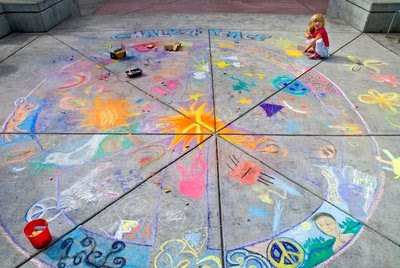 YOU ARE BRINGING THE SUNSHINE OUT 4 CHALK4PEACE! 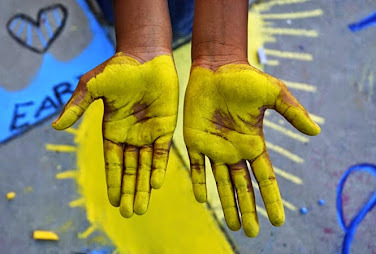 Piedmont, California have repainted the planet so far this year! so that we can share them with the world!! 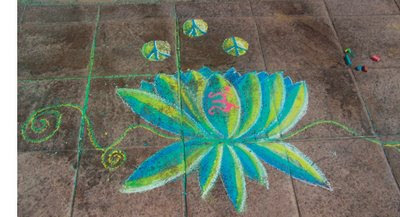 "GONNA BE A BRIGHT, BRIGHT SUNSHINY DAY"
CHALK4PEACE 2008 at St. George's Cathedral! Here's one of their amazing drawings! 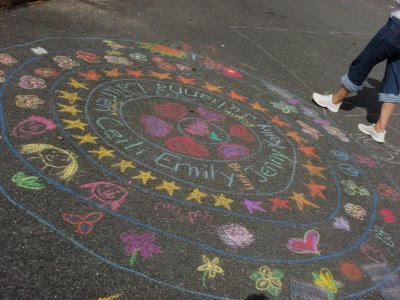 for being such great CHALKSTARS! Thanks to Johnny Nash for the title of today's post. CLICK ON TODAY'S TITLE TO SEE THE PHOTOS FROM CAPE TOWN! Click on the POST TITLE to see the article. Very Nice! Thank you Pasadena Weekly! SCROLL DOWN FOR GLOBAL SITES INFORMATION! 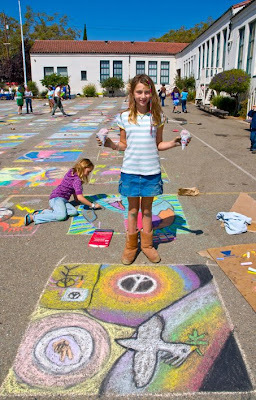 CHALK4PEACE FRONT PAGE ON YOKO ONO'S IMAGINE PEACE WEBSITE! 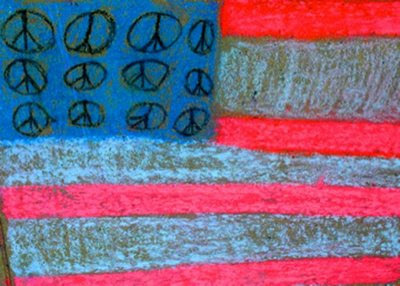 Yoko Ono's website dedicated to Peace! 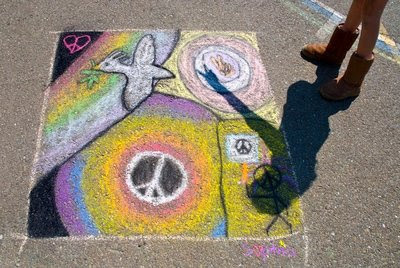 CHALK4PEACE. My (our) wish came true!!! wherever you may find it! MAKE A WISH! who are GIVING PEACE A CHANCE!!! Dr. Martin Luther King, Jr. Memorial Library (DC). 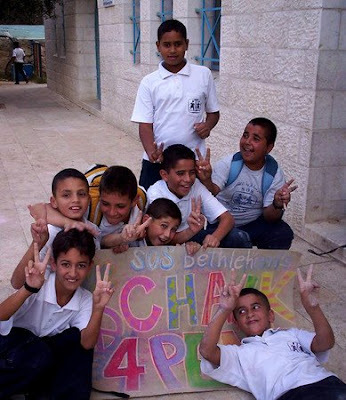 educators worldwide who encourage the teaching of peace. What a great spirit of cooperation! 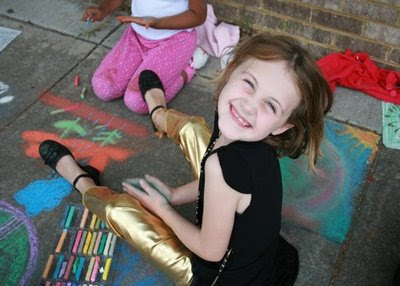 BELTWAY- YOU ROCK YOU CHALK! CHALK4PEACE '08 BEGINS SEPTEMBER 14th! 1:30 p.m. - 4 p.m. 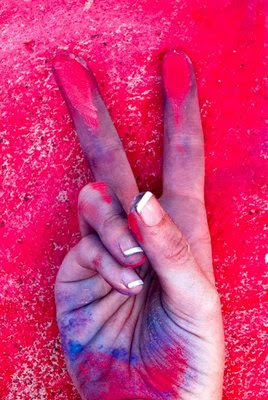 THE CHALK DUST IS RISING...CHALK4PEACE IS ALMOST HERE! in the Bay Area, ZEUM and MOCHA are joining us again! Famous Pancake Breakfast! 1,200 people are expected to attend! 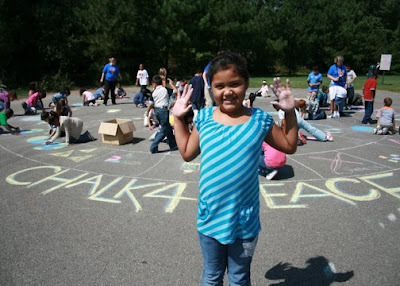 with a dozen schools involved with CHALK4PEACE!